Facial nerve schwannoma is a rare benign tumor which can be seen on facial nerve. It is difficult to separate from vestibular schwannoma with magnetic resonance imaging (MRI). General somatic sensorial branch and taste branches of the facial nerve are located on geniculate ganglion. Although facial nerve involvement by schwannoma is a rare entity, it might be presented by newly onset facial nerve paresis or paralyzes, conductive type hearing loss due to otitis media or mass effect. We are presenting a facial nerve schwannoma of the tympanic segment which obstructs mastoid segment and causes facial nerve paralyzes, treated through transmastoid surgical excision successfully. 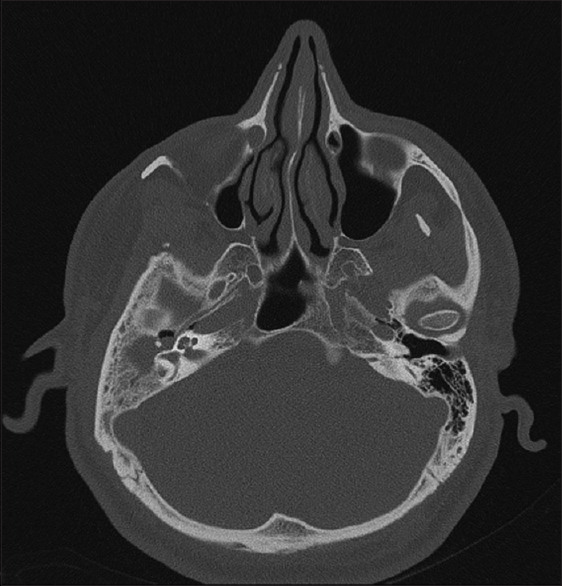 A 46-year-old male patient is admitted to the outpatient clinic with a complaint of on-going ear drainage 7 months ago. The patient was prescribed with local antibiotherapy, but otitis media was not healed, so he was operated. During surgery, it was recognized that there was a mass on the middle ear cavity so surgeon took biopsy and decided to finalize the surgery. The pathologic investigation was facial nerve schwannoma, so the patient was referred to our clinic. On physical examination, the patient has house–Brackmann Stage 3 facial paralyzes. After MRI and computed tomography scan investigation, the patient is decided to operate with transmastoid approach [Figure 1] and [Figure 2]. During surgery, we have recognized that facial nerve of tympanic segment is defective. The tumor was arised from this segment and spreaded to mastoid segment. Malleus and incus bones were eroded due to tumor and segment tympany also eroded, but dura was intact. All the tumor was resected successfully. 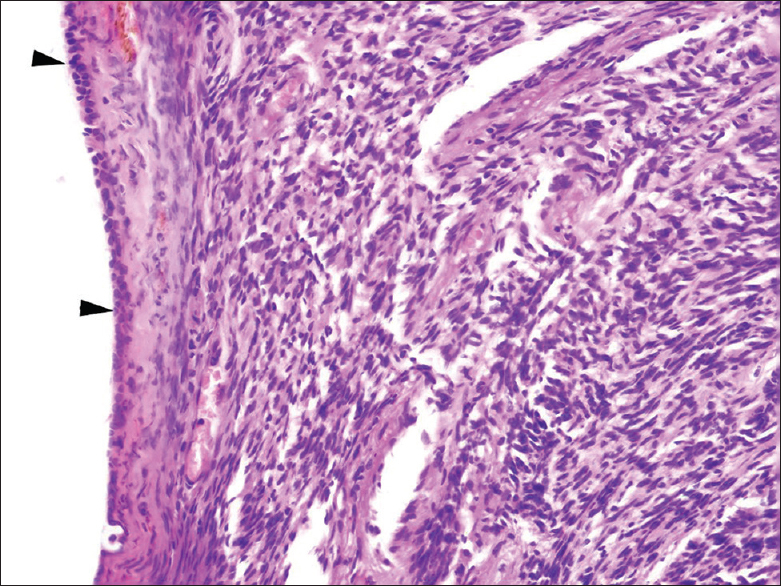 The pathologic investigation also showed the schwannoma [Figure 3]. After surgery, facial nerve paralyzes remained stable, so plastic surgery clinic applied upper eyelid implant and canthopexy. Facial nerve tumors might be seen any part of the facial nerve but commonly seen on perigeniculate and tympanic segment. In our case, the tumor was detected on the tympanic segment. Most typical symptoms are facial nerve paresis or paralyzes, hearing loss, tinnitus, otorrhea, otalgia, and vestibular symptoms. In our case, both facial paralysis and otorrhea were detected. Facial nerve schwannoma is the most common tumor of the facial nerve. Saito and Baxter showed in a study that intratemporal schwannoma has a incidence of 0.8% in a 600 temporal bone material. In our case, we have diagnosed the tumor on the tympanic segment. Facial nerve schwannoma can be treated by microsurgery methods. Facial nerve functions should be supplied by these methods. Treatment methods are wait and observe, fallopian canal decompression, and stereotaxic surgery. In our case, we decided to perform surgery due to facial nerve paralysis and otorrhea. If there is not any facial weakness, the method which preserves the facial function should be used in first response. On the other hand, when the facial nerve paralysis, labyrinthine segment erosion or brainstem compression are detected, the facial nerve might not be preserved during surgery. In our case, we performed the transmastoid approach to excise the facial nerve schwannoma. At the end of the surgery, the facial nerve function is not changed. To supply the eye closure, plastic surgeon performed the canthopexy and upper eyelid implant. On the follow-up, we do not detect any recurrence. 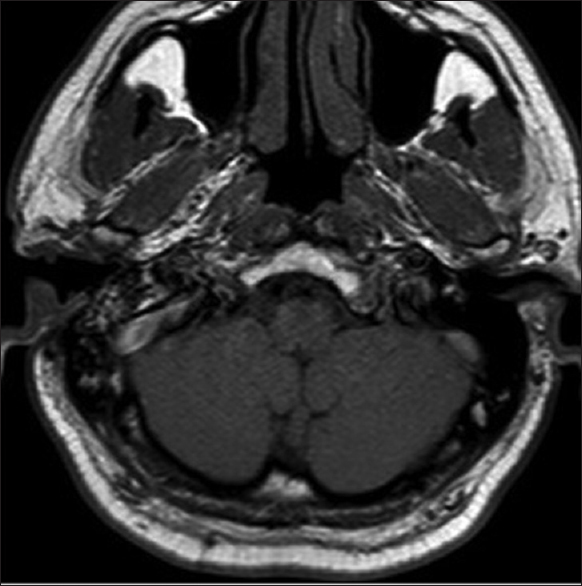 We should keep in mind the facial nerve schwannoma in middle ear cholesteatoma cases. Kirazli T, Oner K, Bilgen C, Ovül I, Midilli R. Facial nerve neuroma: Clinical, diagnostic, and surgical features. Skull Base 2004;14:115-20. O'Donoghue GM, Brackmann DE, House JW, Jackler RK. Neuromas of the facial nerve. Am J Otol 1989;10:49-54. Saito H, Baxter A. Undiagnosed intratemporal facial nerve neurilemomas. Arch Otolaryngol 1972;95:415-9. Minovi A, Vosschulte R, Hofmann E, Draf W, Bockmühl U. Facial nerve neuroma: Surgical concept and functional results. Skull Base 2004;14:195-200. Shirazi MA, Leonetti JP, Marzo SJ, Anderson DE. Surgical management of facial neuromas: Lessons learned. Otol Neurotol 2007;28:958-63.